DDA’s affidavit gives point by point reply to nine questions put by a bench headed by Justice Madan B Lokur if various assessments like environment impact, traffic, congestion and other safety aspects were made before going ahead with the amendment. 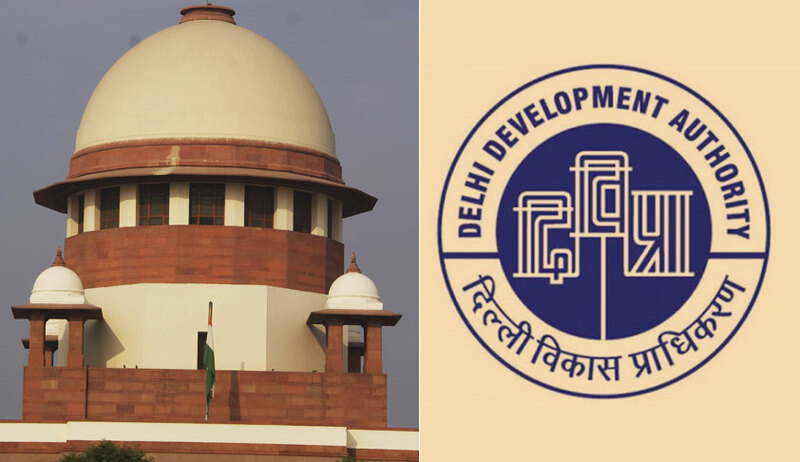 Filing an affidavit in the sealing case, the Delhi Development Authority has urged the Supreme Court to lift the stay imposed on the amendments in Master Plan Delhi aimed at giving relief to commercial properties by easing the mixed land use. On March 6, a bench headed by Justice Madan B Lokur put on hold any further move to amend master plan angry with the DDA as it had not filed an affidavit as per the court’s order on February 9 explaining if various assessments like environment impact, traffic, congestion and other safety aspects were made before going ahead with the amendment. “It is respectfully submitted that on account of the ever-growing population in Delhi, there had been perpetual requirements for additional housing, employment, social infrastructure, shopping centres, public and individual transport etc. Shrinking space of convenient marketplace/ centres have created a requirement of mixed-use which allows access to commercial activities in the proximity of residences and reduces the need for commuting across zones in the city”, said the affidavit. “Mixed use of land also needs to be regulated in order to manage and mitigate the associated enhanced impact of the aspect of congestion, traffic and civic amenities. For meeting such objectives, suitable modifications in the master plan are required to be carried out from time to time while keeping in view the need for growing population of Delhi and also the existing ground realities and future needs of the city following the principle of service seeker and service provider to be in the same neighborhood”, said DDA. 1)SC: Environment Impact Assessment done before making any modification as proposed? DDA: Master Plan for Delhi 2021 is a statutory plan addressing the planning and regulatory matters. All such projects and which fall within the purview of EIA notification dated 14.09.2006 issued under section of the Environment Protection Act would be required to take necessary steps in accordance therewith. The DD Act 1957 does not mandate for securing environment impact assessment for carrying out any modification of the master plan. Proposed modifications are not in the nature of changing existing population density within colonies nor they are in the nature of effecting important alteration of the plan and they do not relate to the extent of land uses therefore they are not expected to cause any congestion on road, parking, pollution and existing infrastructure or civic amenities. Outdoor units of air conditioning shall not extrude from the plot line and has to be placed on rooftop. Exhaust ducts shall not open directly towards the public lane or face residential plot. 3) SC: Whether any steps have been taken to effectively manage traffic in consultation with the Delhi Police in view of the proposed changes? Emphasise on the requirement of sufficient parking spaces, regulating commercialization and mixed-use activities, rationalization of payment of various charges. Demarcation of separate spaces for parking for residents and visitors of commercial establishments in the residential areas. 4) Whether fire safety measures have been considered and access 3 to fire engines etc. Local bodies in consultation with traffic police to conduct periodic traffic assessment studies. Parking of vehicles of those coming to shopping centres shall not spill over to common public areas and residential colonies. 6) Whether civic amenities are available and have been provided particularly the availability of water not only for drinking water but for other purposes as well (such as dousing fire), management of sewage disposal, Solid Waste Management and supply of electricity etc. DDA: Due to the proposed modification, there is no change in the already existing populations/density within the colonies the stress on existing infrastructure amenities shall be minimal. 7) Whether the safety of buildings which have been and which are sought to be constructed upon has been taken into consideration and whether any assessment has been made of all these buildings so that the life of the people in the buildings are safe and secure? DDA: Polluting and hazardous services shall be prohibited in residential areas. 8) Whether the issue of population density in Delhi said to be in the region of 1.67 crores – 2 crores has been taken into consideration? DDA: Proposed modifications do not have any repercussion on the existing population as the number of commercial establishments are not proposed to be increased. Rather, the emphasise is on the requirement of sufficient parking spaces, regulating commercialization and mixed-use and rationalization of the payment of various charges. 9) Whether any information/statistics is available with the Delhi Pollution Control Board or Centre Pollution Control Board with regard to the pollution in Delhi from 2006 onwards till date particularly when there was liberalization in the roads notified for mixed use or a commercial use. If so, steps taken to reduce the pollution. DDA: This aspect would be required to be answered by the concerned authorities. However, while considering permission as per the proposed amendments in the master plan, the focus of all land-owning agencies shall be to undertake the immediate removal of encroachments on the public land and maintenance of such areas for parking, green areas, parks etc.